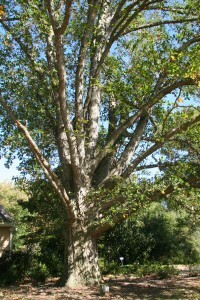 Overcup oak gets its common name from its acorn, which is almost entirely covered over by its cup. It can take from 25 to 30 years before the tree produces acorns, and they are one of the few white oaks whose seeds do not germinate until spring. Predominantly found on poorly-drained bottomlands, it can reach up to 90 feet in height, but will usually be smaller. Its form and quality vary greatly throughout its range. Overcup oak leaves are deciduous, 6 to 10 inches long, and separated into 5 to 9 rounded lobes by deep or shallow sinuses. Its acorns are fairly flat and one-half to 1 inch long.